Its time to turn on your porch light, get out and meet your neighbors and take back from your neighborhood from undesirable elements. 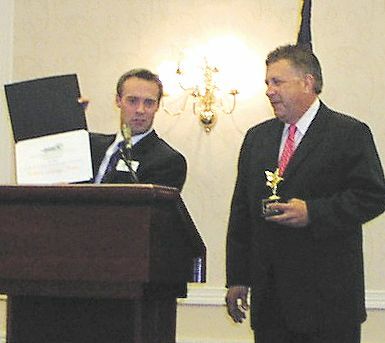 The 24th Annual National Night Out, a unique crime/drug prevention event sponsored by the National Association of Town Watch, has been scheduled for Tuesday, August 7, 2007. The purpose of National Night Out is to generate support for, and participation in, local anticrime programs; strengthen neighborhood spirit and police-community partnerships; and send a message to criminals letting them know that neighborhoods are organized and fighting back. Among local activities planned are a Food, Fun & Fellowship Pot Luck Dinner: Bring Your Favorite Foods. Bellmar & Northline Civic Club jointly sponsor the event. 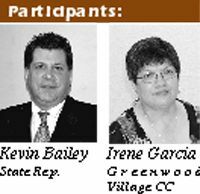 The civic clubs are inviting anyone living in the East Aldine Management District (formerly the Airline Improvement District Area). There will also be door prize drawings. Bring something for the door prize drawing, if you would like. For information contact Zera Presley, President Bellmar Civic Club at 281-445-0337 or Rose Hamlin, President Northline Civic Club at 281-448-5562. A community gathering will be held at the James Driver Park, 10918 1/2 Bentley from 6 to 9 p.m. For information contact Mary Lavespere at 281-442-7950. Riverwood Estates is hosting a community gathering at 6714 Moss Oaks Dr. from 7 to 9 p.m. For information contact Brenda Blount at 713-725-3174. The Audubon Park CIA will hold a community gathering at the subdivision pool, 15725 Mesa Dr. from 7 to 9 p.m. For information contact Kenneth Jordan at 281-441-2810. The Harris County Sheriffs Office is asking that groups hosting National Night Out Events register the information with Aldine substation on Aldine Mail Route. This information will be included in a county-wide database for those looking for local events to attend. Throughout the community block parties and gatherings are being held. Last years National Night Out campaign involved citizens, law enforcement agencies, civic groups, businesses, neighborhood organizations and local officials from over 10,000 communities from all 50 states, U.S. territories, Canadian cities and military bases worldwide. In all, over 34 million people participated in NNO 2006. They often meet people on possibly the worst day of their lives. But, through years of training and the latest in medical equipment, the staff of the Emergency Services District #1 is ready to handle any emergency that comes through northeast Houston/ Harris County. The first district of its kind in the state, ESD#1 has a staff of 51, 98% of which are paid who are ready 24/7 to answer the call of someone who is in need. These crews service an area bordered by the Sam Houston Race Park on the west to Summerwood in the east and from FM 1960 in the north to the Houston city limits. Within this area there are approximately 500,000 residents. A recent survey shows that on any given day, 33 percent of the residents in Harris County pass through the district. Keeping up with the approximately 1,600 calls they take each month requires a large fleet. Among the 14 ambulances that make up the fleet are two special vehicles that they acquired over the past few months. Troy Parks, EMS supervisor, said that last year they sent an ambulance to New Orleans to assist in the wake of Hurricane Katrina. While there they discovered how restrictive an ambulance, which at best can serve two patients at a time, could be in a mass casualty scenario. Bringing this information back, they took on the project of bringing a mass casualty unit to the county. With the appearance of an RV on the outside, the vehicle is all business inside. With a capacity of seven patients at one time Parks said they are ready to handle any natural or man-made disaster that occurs. 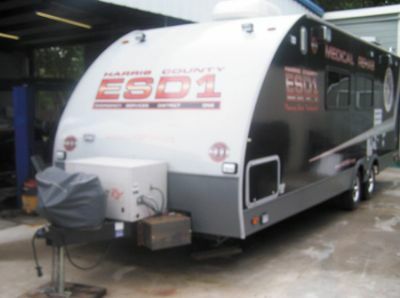 The mass casualty unit is also the only one of its kind in Harris County. A couple of months ago, the ESD#1 added another specialized ambulance to their fleet. The Critical Care Unit vehicle is designed especially for transporting critically ill patients from one facility to another. Looking like an ambulance on steroids, the vehicle is built on a heavy-duty chassis with a larger patient area. This larger area is key to transporting the IVs, monitors and other medical equipment a critical care patient would need to maintain while in transport. The critical care unit does not come cheap. A stripped down version of the unit costs about $128,000. Then comes the paint and equipment needed to put it in service. The ESD#1 is not just about transporting patients or rescuing victims from accidents. Parks said that they are working to be an active partner in the community. Over the summer the mass casualty unit has been visiting schools within Aldine ISD to provide fitness exams students which are required for athletics. The vehicle has been to Aldine and MacArthur High as well as Aldine Middle and Plummer Middle School. Parks said they offered this service because they knew that it is hard for students to get to a doctor or clinic for the required exams, so they wanted to help facilitate a convenient and low-cost alternative. These exams brought forth a health concern which the ESD#1 would like to take on as a community project. Many of the students, Parks said, had vision issues. Parks said they would like to partner with local optometrists and other businesses to provide low cost exams and glasses for the students. Other projects in the works for the ESD#1 is a mass CPR training and car seat project. Parks said that would like to set aside a day where they can teach parents how to properly install car seats and that if they could get some donations, provide car seats to those who could not afford them. NORTHEAST HOUSTON Last Saturday 3 different organizations held Back to School/Health Fairs, with remarkably large turnouts. Greenspoint Mall hosted a health fair with free immunizations and backpacks, cosponsored by Harris County Hospital District, Houston Dynamos, and others. Houston Community College had a Fair at Northline Mall, with entertainment, food, games and class registration. 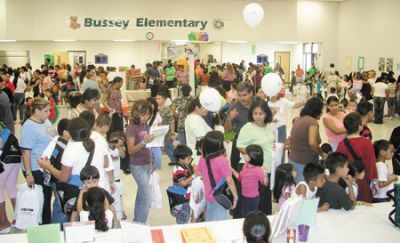 But the largest Fair saw about 4000 parents and children show up at Bussey Elementary on Airline, and endure long lines as they waited patiently for free back packs, school supplies, and immunizations, and much more. About two dozen organizations had booths, displays, games, and give-aways that kept everyone happy. This Fair was sponsored by Texas Childrens Hospital Health Plan, Aldine ISD, and the YMCA. Next weeks Northeast News will have MORE photos and features about the Fairs. While walking to the truck this morning, a bird took flight just ahead of me. At first it looked like an owl and it landed on the other side of the truck, not far off. I walked over there and the bird took another short, flight landing on some concrete. This time I walked directly up to the bird or as close as I thought I should get and observed the bird colors and feathers, thinking I should know what sort of bird it is. Sure wish I had my camera too. Sure as shooting, Google described the bird and has a picture of one exactly like it. It was a Whippoorwill, no doubt. Used to hear them down in the river bottom of the Chattahoochee River way back when, and always when it was dark. There is some folklore that goes with the Whippoorwill. An unmarried woman would listen for the sound of the Whippoorwill. One call means shell not get married for a year. Three calls mean she will be destined to be a spinster. Two calls means impending matrimony. Google goes on to say that repetitious calls were often considered an omen of death to the Omaha Indians. The Ute Indians believed that the Whippoorwill was the god of the night and could magically change a frog into the moon. Iroquois believed that the lady slipper was the Whippoorwills shoe. The bird didnt make any sound when I was around so reckon that means it didnt want to be bothered. It made my day to say the least, it is not everyday that one sees a Whippoorwill much less know what one is. Have you ever heard the call of a Whippoorwill? The twin son from Pennsylvania and his clan have been down all week; they went back this afternoon with web feet. He and I put up 15 pints of chowchow early one morning and got in the dog house with Big Momma. She said we started too early and should have waited a bit. With the two granddaughters, I always take them to Wal-Mart one morning at six oclock; they love it. This trip we took the other granddaughter with us. Ages 12, 10 & 5. Do believe they can smell the toy section of the store because that was their direction. Then next thing I know they are looking at bras. Nearly dropped my teeth when the 10 year old got one. I made a comment about why she was buying a sling shot so when we got home, she told on me. Just so you know where I stand, I think Prisoner of Azkaban was the best Harry Potter film in the series, with Goblet of Fire coming a very close second. The first two films werent that great, in my opinion. Theres a lot to like about Phoenix. The special effects are great; and all the performances, from the stars to the supporting cast, are spectacular. Daniel Radcliffe has really grown into a fine actor, and his portrayal of the young wizard in this film is his best yet. Also worth noting is the performance of Imelda Staunton as the smiling, torturing Dolores Umbridge. There is a scene where she punishes Potter that is chilling to watch. It reminded me of Laurence Oliviers torture scene in Marathon Man. It was that intense. The biggest flaw in Phoenix cant be laid completely at the feet of the filmmakers. Some measure of blame rests with the novelist J.K. Rowling. The novel was nearly 900 pages long. In order to pack so much into a two-hour film, a lot of the book had to stripped away. The resulting film is a kind of Cliffs Notes version of the book. 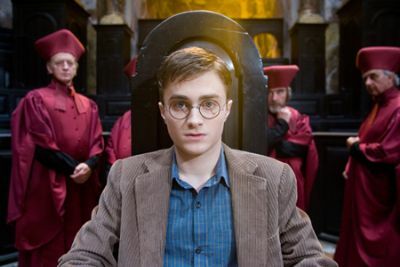 It also reveals that the plot of every Harry Potter book/movie is the same: A new year at Hogwarts and a new teacher who will turn out to be evil. Harry and Co. learn a new spell that will come in handy in the final act. Harry fights some version of Voldemort, only to be rescued in the end by someone. There may or may not be a quidditch match. Sound familiar? The choppy, episodic nature of the movie is its greatest flaw. Phoenix needed to be at least a half-hour longer so that certain events (like Harrys first kiss, and the death and aftermath of a major supporting character) could be given enough time for the characters (and us) to feel their emotional impact. Still, Harry Potter and the Order of the Phoenix is well worth your time. 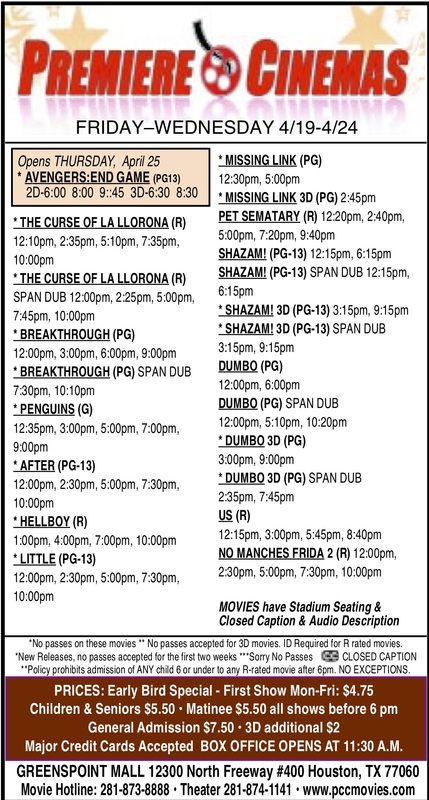 Despite its flaws, the performances and effects make it worth a trip to the mulitplex. North Houston Greenspoint Chamber members heard a thorough status report of the 3 management districts functioning in the area, and the redevelopment district, at the Chambers monthly luncheon held at the Airport Marriott last Thursday. Humor was mixed with fact, as Chamber president Reggie Gray presented State Representative Kevin Bailey with a mock resolution honoring him for his work in establishing the legislation that formed the districts. In addition, Bailey received a real award for work in forming the Greater Greenspoint, East Aldine, and Airline Districts, and the Greater Greenspoint Redevelopment Authority. These are taxing bodies, that provide additional services to residents and businesses in their service areas. Accomplishments, and future projects, were reviewed by Jack Drake for the Greenspoint District, David Hawes for the East Aldine District, Teri Koerth for the Airline District, and Sally Bradford for the redevelopment agency. Each agency is working to provide nuisance abatement, grafitti removal, economic development, water and sewer improvements, additional security and safety, parks and recreation facilities, flood control, new roadways to improve mobility, new signage and artwork, and more. All the organizations recently joined in United Districts of North Houston,along with Greater Northside Management District, to be more effective and coordinate their work. HOUSTONThe start of school just got a little more complicated for North Forest ISD students. Forest Brook students will join their classmates at Smiley this fall as the district works to repair damage at the high school. 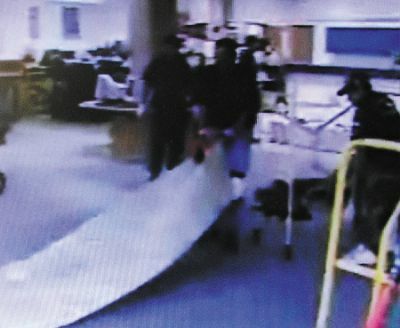 During an emergency meeting of the Board of Trustees on July 17, voted to move the Forest Brook staff and students to Smiley, saying that the damage was too extensive to be repaired before classes start on Aug. 27. To date, there is no estimate of the amount of damage or of how long Forest Brook students and staff will remain on the M.B. Smiley campus. The school district has contracted with Texas General Construction to restoration and construction services. North Forest ISD is cooperating with that investigation, Walker said. At its regular board meeting last Tuesday night, the East Aldine district approved funding to start studies on new trunk sewer and water lines near US59, between Langley and East Little York. This extension of a sewer main will allow future service to the Sherwood Place subdivision, and other surrounding areas. It will tie into existing water and sewer lines of the city of Houston. The contract for the study was let to Montgomery & Associates, and will eventually lead to a bond issue of $10,000,000 to build needed water and sewer lines in the area. It was also reported that sewer and water work in the Tasfield area is now complete, and hookups of individual homes is proceeding. The EAMD board heard a financial report, indicating that sales tax revenue collections are exceeding projections. 2007 collections to date are up 33% over the same period last year. The district has $4 million in the bank, and it looks like it will receive that much in revenue for all of this calendar year. Although a strong security and public safety report was made, nevertheless director Reyes Garcia questioned the increase recently in crime incidents, and suggested that we study the need for another deputy, and a drug dog for the districts officers. Houston police are investigating the fatal shooting of a man at 9902 Homestead about 2 p.m. on July 17. According to HPD Homicide Division Sergeant A. Carrillo the victim, Henry Bang Tran, 54, suffered multiple gunshot wounds and was pronounced dead at the scene. Carillo said that investigators believe a struggle ensued between the victim and suspect. 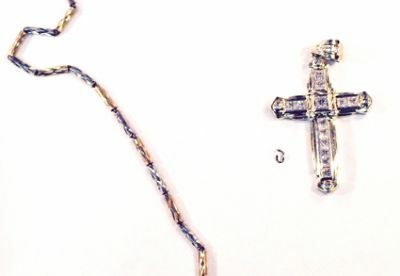 A white and yellow gold chain, approximately 20-24 inches in length, along with a diamond cross was found near the victim. The chain and cross are believed to belong to the suspect and might have been ripped off the suspect during the struggle. Homicide Division at 713-308-3600 or Crime Stoppers at 713-222-TIPS. The Aldine Ratepayers Association has filed a Motion to Intervene on behalf of association members who are directly affected by the water and sewer rate increase sought by Texas American Water Company. 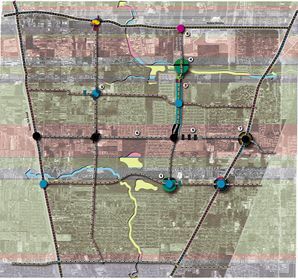 The contested water rate case impacts several local subdivisions including Greenwood Village, Mary Francis, Kenwood, Bertrand, Aldine Meadows and Colonial Hills. Bailey explained that the East Aldine Management District agreed to hire attorney Jim Boyle of Austin to represent area residents in the hearing process. A court date has been set in the contested water rate case brought by Aldine Ratepayers Association against Texas American Water. The hearing will be Tuesday, August 7 at 10 a.m. at the State Office of Administrative Hearings located at 2020 North Loop West, Suite 111 in Houston. The hearing will be held to establish jurisdiction, name parties to the case, establish a procedural schedule for the remainder of the proceedings and to address other matters as determined by the judge. The last time a North Houston neighborhood actively challenged a privately owned water utility, residents had to travel to Austin to attend the hearings but changes in state law now provide for local hearings. Persons with disabilities who plan to attend this hearing and who need special accommodations should call the State Office of Administrative Hearings Docket Department at 512-475-3445, at least one week prior to the hearing. Local neighborhoods impacted by the hearing include Greenwood Village, Mary Francis, Kenwood, Bertrand, Aldine Meadows and Colonial Hills.